Zildjian ZHT Medium Ride 20"
We happily took some crashes and hi-hats out on a gig, but we passed on the rides. The hi-hats felt genuinely pro, but once the volume was up the crashes didn't quite have the presence and projection of more expensive top models. Fair dos, their tone remained sweet. Zildjian says the ZHT is its most musical sheet bronze series yet and we have no trouble agreeing. Zildjian’s best, most musical stab at a sheet bronze cymbal range ever. The rides and mini hi-hats offer unpleasant aftertones. ZHT: Serious looking, medium priced cymbals. Zildjian refers to their budget cymbals, which include the ZHTs, as sheet bronze. 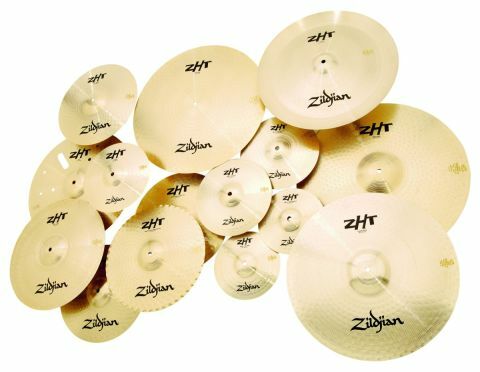 Zildjian refers to their budget cymbals, which include the ZHTs, as sheet bronze. This is to distinguish them from their pro cymbals, which are formed from individual castings. Sheet bronze cymbals were previously made from B8 bronze, with its low tin content of eight percent. Zildjian's cast cymbals have 20 percent. The new ZHTs split the difference with B12 - 88 percent copper and 12 percent tin. That extra four percent gives the ZHTs 'increased musicality' compared to previous budget efforts. So how does this manifest itself? Starting with the crashes these come in 14", 16" and 18" diameters and a good selection of weights. There are four 18" crashes - Fast, Medium-Thin, Rock and crash-ride. The 18" Rock is bright and loud, with a penetrating, rounded tone, almost orchestral. The 18" crash-ride is pretty close, but a little heavier and brighter. You can crash it and continue riding without losing stick definition, which is clean but thick. The bell is the best of the bunch too. The 18" Fast is deeper and smoother, quicker to respond and shorter in decay. The 18" Medium-Thin is deeper still, quite silky but with more body. This one is probably our favourite. The same applies to the equivalent 16"s. They are uniformly good with quick attack and harmonious decay. Even the final, lingering overtones are less discordant than is usual for mid-priced cymbals. The single 14" Fast crash is surprisingly full- bodied, again smooth and fast, with a higher pitch. This full character reaches right down to the 10" and 8" splashes too. An enjoyable set of crashes then, but moving on to the rides was disappointing. With budget kits it's the snares that don't cut it, with budget cymbals it's usually the rides. Accordingly, the ZHT rides were our least favourite of the series. The 20" Rock and Medium rides are fine to play - the tip of the stick elicits a thick tone with an agreeable feel - and the fundamental pitch of each cymbal, which is slightly lower on the Medium, is ok. But then there are brassy, clangy overtones that scream 'budget cymbal'. The third ride, a 20" Flat, was the most puzzling. It sounds as though it's being distorted through an electronic processor. It doesn't go 'ting', it goes 'zing'. In fact, it goes 'zzzziiiinnggg', like an electric razor. If you want a dark electro sound, this might be your dream cymbal. As a traditional flat, however, it's a weird one. It has crisp stick response though, which you would expect from a Flat. On the hi-hat front we have no less than six pairs. Three are standard 14"s, then a 13" and two mini pairs, an 8" and a 10" The standard 14" pair is as good an all-round pair of hi-hats as we've heard. There's a perfect blend of dark and bright and no horrid overtones - clear and strong, with a warm tone. The 13" pair gives a little extra bite, but we think the 14"s just about edge it. The 14" Rock hats are a fraction heavier and louder, however the contrast with the 14" Mastersound hats is sensational. These have a wavy edge bottom cymbal which changes the response drastically. The cymbals are higher in pitch and, when half-open, the sound sizzles like a pan of bacon. Even when closed, the bottom cymbal makes a difference, adding a rasping, toppy sibilance. The pedalled sound is also crisp so if you need this sort of brazen cut, these are the fellas, though they're tricky to play softly. That leaves the two disappointing mini hi-hats. Although individually each cymbal seemed fine, when paired up both sets produced squeaky overtones we couldn't get rid of. Increasing the foot pressure only made them worse. The 10" set had the better tone, the 8" being especially shrill and brittle. It's a shame, as these should be cute, but we don't know how you'd get past the overtones. To end on a high, we liked the EFX cymbals. There's a 16" and 18", which are thinnish and have geometric shapes cut out of them. The result is a trashy sound halfway between a normal crash and a China. They're both intriguing and the 18" works as a dirty ride too. Finally, there are two cool chinas, 16" and 18". They sound more strident than the EFXs, but not too painful, more trashy than abrasive. So, a mixture of desirable and just-about-ok. The cymbals look serious and the pricing is between budget and pro, which is exactly right.